Well, technically mice themselves have always existed in three-dimensions. Still, Sandio Technology really thinks that with the preponderance of 3D-aware software, the existing pointing device needs to be upgraded a bit. They've added three digital "rocker" switches (of the type familiar to joystick users as "hat" switches) to the mouse, each of which can be moved in four directions. Each direction can be mapped to a key. 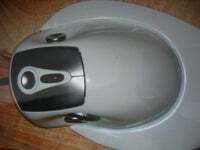 The primary application of the 3D mouse seems to be gaming, specifically first person shooters. A Sandio employee told me that it takes about 20 minutes for a gamer to become accustomed to the system; certainly I didn't come anywhere near to mastering it in the couple minutes I tried. Still, by duplicating many of the things you want to do on the keyboard on the mouse switches, it does free up your other hand to perform other functions. The other application that they're looking at is software that operates primarily in a 3D space. Google's Sketch Up is a good example; the 3D mouse lets you interact with the environment more organically. Sandio will be releasing two models: a gaming model later this year for $80, and a professional version, for 3D applications in early 2007. The difference will primarily be one of which applications the mouse is set up to be used by default. Sandio is investigating Mac compatibility.